Founded in 2003, the Valley Alliance of Neighborhood Councils (VANC) provides educational and outreach opportunities and serves as a voice for all 34 Neighborhood Councils in the Valley. VANC gives "Best of..." awards each year at their annual spring mixer. 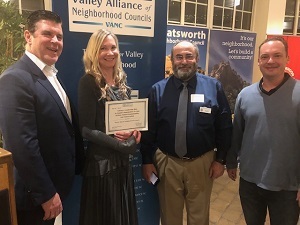 This year, VANC honored the Porter Ranch Neighborhood Council (PRNC) with the Best of Award in "Taking a Leadership Role to Inspire Stakeholders to Take Action Toward Sustainability and Conservation." The PRNC's actions include incorporating sustainable principles into their meetings, advocating for the elimination of gas-powered landscaping equipment, stopping the spread of bark beetles which kill trees by funding the removal of dead and dying Canary Island pine trees which host and spread the infestation, and inspiring stakeholders to do the same in their lives. Northridge West Neighborhood Council also received a "Special Mention" for the addition of three steel framed horse topiaries to the Tampa median, as a follow up to their 2018 award for the Tampa median improvement project. 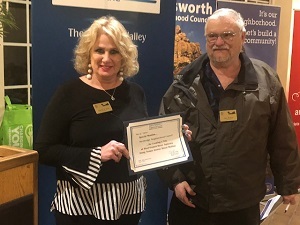 Other winners included the Sherman Oaks Neighborhood Council for public safety programs and Lake Balboa Neighborhood Council for outreach efforts. You can see the full list of winners here. Congratulations and thank you for your excellent work!